Generating an Income Stream from the Market Featured - Trading Concepts, Inc. 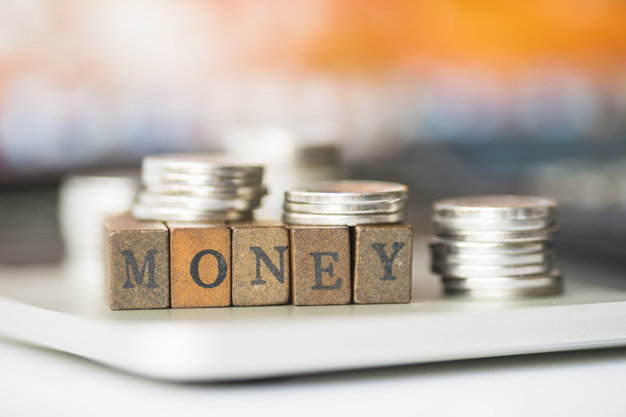 Generating an Income Stream from the Market Featured - Trading Concepts, Inc.
Before we can start to pull out a consistent income stream from the Market, it’s important that we understand what we’re doing wrong first. Yes, “we” who have gotten most of our education about the Stock Market through watching E*Trade commercials and TV personalities like Jim Cramer. Trade Risk/Reward: when we’re trading, there is no reward without risk. Conversely, if there is no risk, there is no reward. Generally, the more risks that you face on a trade, the higher the reward should be. Event Risk: the risk that some event could come along unexpectedly and influence the supply or demand for your trade. This could have a positive or negative impact on the price, you just don’t know ahead of time. These are not the only two dimensions that we can plot our trades on, but these are very important. Let’s combine these dimensions by plotting the Risk/Reward of a trade on the vertical axis of a chart in Figure 2, and let’s use Event Risk as the variable on the horizontal axis. So Risk/Reward increases as we go higher on the vertical axis, and Event Risk increases as we move to the right on the horizontal axis. Non-Directional Trades are going to have less risk and less reward than Directional trades are, so the bottom two quadrants are Non-Directional and the top two quadrants are Directional. Index trades are going to have less Event Risk than Individual Equities due to the lack of Earnings Reports, Management changes, warnings, surprises, etc. When we put it all together, we can see that the quadrant with the least amount of Risk/Reward as well as the quadrant with the least amount of Event Risk is the lower- left quadrant. Conversely, the quadrant with the highest Risk/Reward and Event Risk is the upper right quadrant. 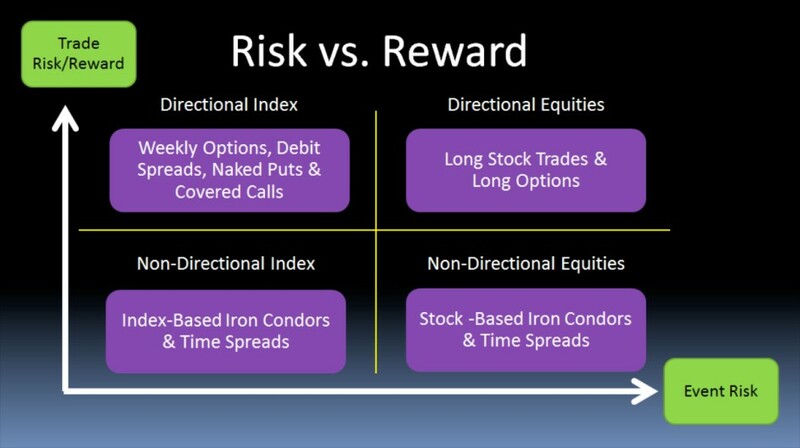 Lower Left: non-directional index-based trades like Iron Condors & Time Spreads. 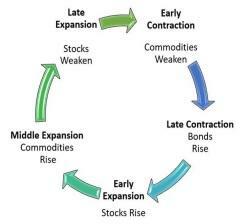 Lower Right: non-directional equity-based trades like Iron Condors & Time Spreads. Upper Left: directional index-based trades like ETF/Futures swing trades, Weekly spreads, debit spreads, and Covered Calls/Naked Puts. Upper Right: directional equity based trades like stock, single-stock futures, long Options, etc. Question for you: What quadrant do 99% of all newer traders begin their trading careers in? You guessed it, the Upper-Right quadrant....the riskiest quadrant of the four. Next Question: Which quadrant should traders begin their careers in? Where else can you find a profession where all of the entry-level trainees start right at the top level? It’s like saying that you think you can swing a bat, so you’d like to try out for your local Major League baseball team. You hit a golf ball at the range pretty well the other day (one out of a whole bucket) so you feel it’s time to tee it up at the Master’s in Augusta.... you check your mail every day for your invitation. Your son just passed his driver’s permit so it’s time to put him in the Ferrari. Example after example where we all have tons of common sense - except when it comes to trading the Market! And believe me, when you place your position in the Market, you’re going up against the very best in the world, every day. There are no minor leagues in Trading. Thanks for the options program…after joining last fall, went to live trading of the high probability IC's starting on the March cycle. The guidelines you provided, and having "them my own" thru paper trading have let me sleep soundly despite all the heat the positions have taken on the last two cycles. It's been nice to make defensive moves during the day, then see your trade update emails come in recommending the same move. Kai D.
Have a great day and I hope this has been helpful.